Interest in patio furniture is picking up again in time for the warmer months, and this year, there’s an increased focus on flexibility. This season, modular patio seating will be the hot item – these sets can be arranged in multiple ways to accommodate all sorts of outdoor activities. Patricia Bowling, vice president of communications for the American Home Furnishings Alliance, says companies introduced more outdoor modular furniture pieces this year than ever. 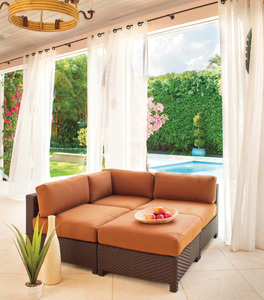 Families and people who entertain also are attracted to this type of furniture, which can be pushed together for lounging in the sun or separated for individual seating at a party. As with any furniture, Bowling suggests first considering how you plan to use the space before purchasing. “One thing to keep in mind with modular furniture is if you want it to do double-duty with dining seating and lounge space, you may want to look at low cocktail tables,” or you’ll need a separate dining area. Steve Elton, chief brand officer for furniture manufacturer Brown Jordan, says the company’s “number one” collection has a sectional piece in it. Due to the popularity, half of next year’s seven or eight new collections will include modular seating, Elton says.